The word “corporate” doesn’t always elicit warm and fuzzy feelings. It’s a word that we – rightly or wrongly – associate with big business, with sleek offices, with big decision-making, large catering budgets and those swipe security cards on lanyards you have to use to access the lifts. So taking an opportunity to subvert it can sometimes be an effective way to defy expectations, create some good energy, surprise people (in a fun way) and remind the staff that work in said offices that the powers that be haven’t forgotten about them. And what better event than Christmas to provide that opportunity! It’s one that allows for plenty of playfulness, generosity and festive spirit for employee rewards and recognition just at that time of year when staff really need it. Afterall, Christmas is traditionally a time to give thanks and to look beyond oneself and to others. Ditch the bulk-bought candy canes and the tacky branded mugs. Give something that is worthy of your employees and your brand by presenting them with a gift that looks beautiful and that represents your business in a positive way. Prezzee Business allows you to brand your eGift Card so that the recipient associates the business with generosity and style every time they access their card. Pop-up Santas, reindeer ears, generic boxes of chocolate can be fun, but they don't always cut it in a corporate environment where image and presentation really matter. Be Christmas classy, not Christmas cheesy. Prezzee’s eGift Cards allow you to include a personal message to acknowledge your employee rewards – so make it personal! With a few well-chosen words you can take what is already an awesome gift and make it even better by demonstrating that you had a hand in choosing it. This kind of authentic leadership from a manager is worth gold. When it comes to organising and purchasing a gift, it doesn’t get easier than Prezzee. And when it comes to using and enjoying a gift – well, ditto. 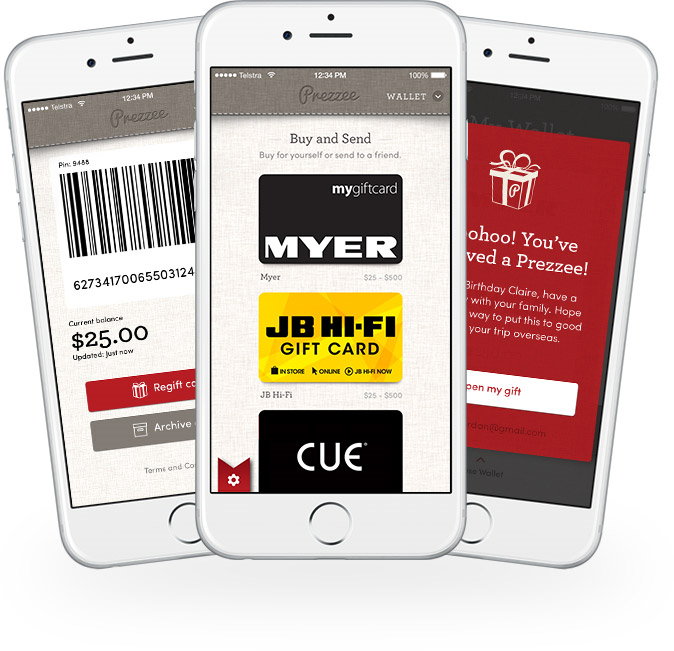 Because Prezzee’s eGiftCards are all about convenience – for the giver and the recipient. Don’t send your EA to stand in an endless cue at the Post Office to buy plastic gift cards. Just pop online and cook up as many eGift Cards – customised to your employee recognition and rewards needs – as you like. Choice and convenience make for very happy recipients. Sure, cash can be fun too, but it often gets used on grocery shopping and paying bills. An eGift Card on the other hand – well that’s all about fun. It’s a no-guilt excuse for the recipient to shop with abandon and treat themselves to something they wouldn’t normally be able to get. The cherry on top is that they associate all that good feeling with their employer – which will make up for a lot of, shall we say, not such good feelings that may have accumulated throughout the year! And one final tip to really get the most out of your corporate staff gift-giving – time it well. Don’t let the gift get lost in all the Christmas chaos. Pick your moment, pay plenty of attention, make it personal and meaningful. Whether you’re giving two hundred cards or just two, each one is an opportunity to build staff loyalty by showing some much-needed gratitude in a way that’s festive and special. Head to Prezzee Business and let us take care of all your Gift Card needs.